When I was pregnant with Max, one of the things I would daydream about was his school years. I hadn't even met my new baby, and already I was planning on being the home-room mom. I would make cupcakes for birthday and holiday parties, and go to PTA meetings. I would surprise my kid at lunch time and with something special brought in, and eat at those little cafeteria tables. I would help his teacher cut out laminated letters, and be at every school play, and track and field day. There have been moments since Max was born that I have passed a schoolyard and felt a lump in my throat about those things never coming to pass. It's this grief you feel at the strangest times, about the smallest of things, when you have a child whose life is not, and never will be like other children his age. For nearly seven years I have had wondered what school would look like for Max. And we have indeed been shocked and amazed at how wonderful it is for him. He is included far more than I ever thought he would be. And because of that, there is a feeling of inclusion for all of us. For the first time, with Max's school stuff, I feel like I'm doing things all the moms of kids his age have to do, get to do. Just a bit more adapted to what he needs. Max has been learning colors in school through February. Each Monday and Wednesday, I set up his table with items that are the color of the day. He has learned to read the words, and then chooses with his eye gaze the color the word says. He'll wear a bandana, or shirt, or hat in the color of the day. We incorporate the lesson around the color. When his teacher told me last week the color for this week, his final color, is grey, I thought..."we don't have anything grey!". Today as I was looking through the house for grey items, I found myself mixing black paint with white playdough. I went digging in the side yard for grey rocks. I sorted through Steve's hats to find a grey one. A black and white picture...that equals grey. A picture of an elephant in a zoo book. I came up with a hodge-podge of grey items, but was stuck on what he would wear. He doesn't have a grey bandana, or hat, or t-shirt. But, when I was looking through his dresser looking for something for him to wear, I found a tshirt my sister bought him last year. 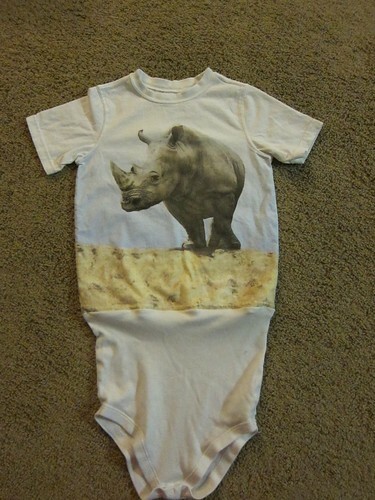 It has a large rhino on it...grey rhino. I went up to my sewing supplies and hoped he had a onesie bottom that could be attached to this never worn before tshirt, with the very grey rhino on the front, to make him a Super-Onesie. I found one attached to the first attempt super-onesie and took it apart to prepare the new one. My sewing machine is up in the guest room, and I can't hear Max very well up there when he's awake, so sewing rarely happens until he's asleep. I waited until about 10:00pm tonight to go upstairs, once he was tucked into bed and asleep for a bit to work on his t-shirt for school tomorrow. I wondered, how many other moms of first graders are working on something for their little one's school day tomorrow? And I smiled, because we have achieved one more thing I never thought would come to be. Tonight, I relish in the fact that I am just another busy mom, with busy days, doing something special for my son to be involved in school tomorrow. I just hope it still fits! In lots of ways, you're just another mom, but in others, you're one of a kind! Your child will most likely thank you one day for all of you active involvement in his life. We need more passionate and involved moms like you. I loved reading this post! You are an awesome mom!